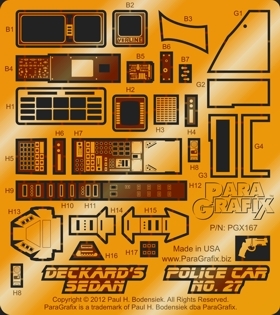 Super-detail the interior of the Blade Runner Deckard’s Sedan or Police Car No. 27 from Fujimi. Set includes options for building either the full, driving car seen on exterior shots (parts B) or the “hero” interior used to film the scenes with the main characters in the car (parts H). Backlight films are included for the computer / dashboard displays, with many options for what to display. In addition, brass cutting templates are included to open up missing windows, and also cut clear plastic (not included) to add the glass. Please see our library of reference photographs HERE.